In addition to ensuring your hardware meets these specifications, most electronics (including computers) have a maximum lifespan of three to five years. Even if your equipment is still working properly after this timeframe, it can quickly become outdated and stop working with modern software (e.g. Microsoft Windows® updates), so be sure to plan your replacements accordingly! From the Ascend Desktop, click the Order Supplies tile. Check out our monthly deals and specials. All purchases of new equipment are backed by the full manufacturer’s warranty. And we make it even easier for you – if we can’t fix it, we’ll send you a new item and navigate the manufacturer’s process ourselves. Plus, get great financing options based on the amount you spend! 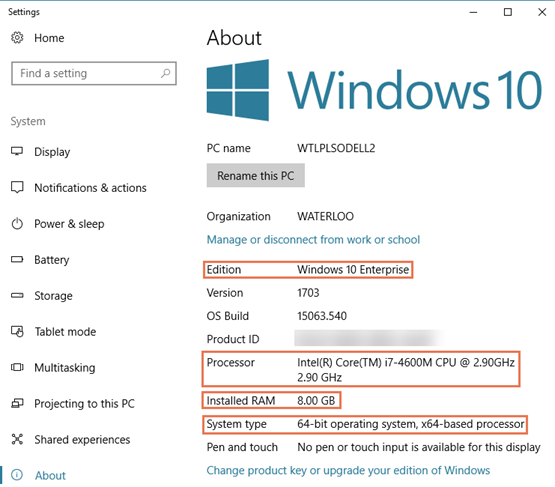 To check your processor and RAM details, right-click the Start menu and choose System. Remember, these are the bare minimum requirements to run Ascend. To get the best performance from your system, we recommend using higher specifications than those listed. Your server (database) computer runs your entire store, and as such, should have significantly higher speeds than your workstations. While we don’t recommend running an actual server (for most stores, that’s far more power than you actually need), you should ensure the computer has ample capacity to control all of your workstations. If your store’s server requires replacement, you must schedule your upgrade with an Ascend Support technician (phone: 877-875-8663, Option 1/email: help@ascendrms.com). This process can take up to three hours, and Ascend cannot be used during this time. Please schedule at least one week in advance so that we can ensure we have adequate coverage to assist other retailers! Microsoft® Excel is required on at least one computer. Computer monitors must use a screen resolution of at least 1280 x 768. Terminals must be purchased from Ascend for proper encoding. Sherpa Tip: Internet providers quote maximum possible speeds. Estimate your actual connection speed at www.speedtest.net. Do not run Ascend over a wireless (wifi) network.